Tim was back and put most of his effort into seeing what he could catch on Urban Baits Nutcracker pop ups and chicken hearts. The nutcracker fished on a method rig was off to a flying start on day one landing four Siamese carp and twice breaking his pb first with a fish of 165lb and then with one of 173lb.Other fish that were caught on the method rig included a stingray, several tambaqui, giraffe catfish and albino pacu, mrigal and mekong catfish. 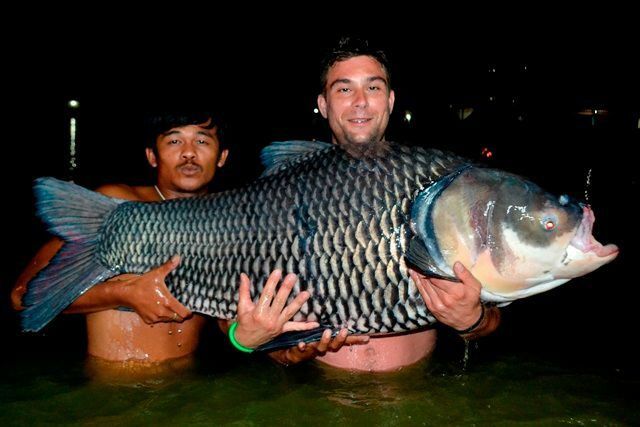 He then switched the nutcracker pop ups onto a zig-rig and caught chao phraya catfish and a surprise 400lb+ arapaima. The chicken hearts also did well accounting for a number of terrific catches that included firewood catfish, African walking catfish, leopard catfish, tiger catfish, wallago leeri and a number of Asian and Amazon redtailed catfish. 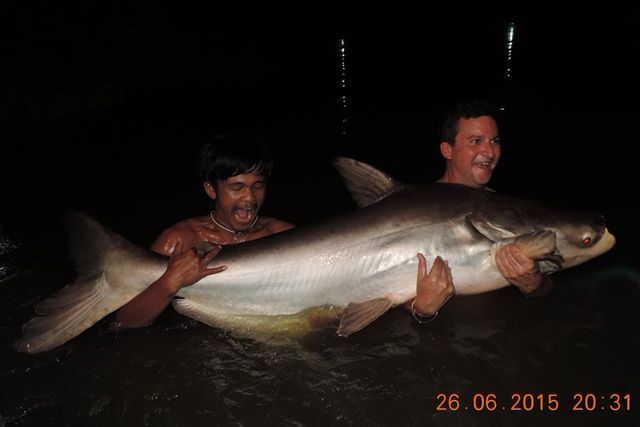 Adam and Tim were out on the Mae Klong fishing for the Giant Freshwater Stingray and ended up battling a giant leviathan from the moment they arrived until it finally succumbed 8 hours and 55 minutes later. 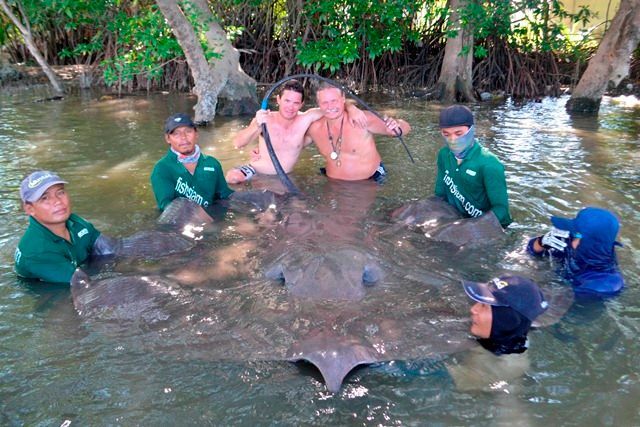 The more than awesome stingray measured a colossal 2.24m x 4.38m the biggest one to come out of the Mae Klong this year. 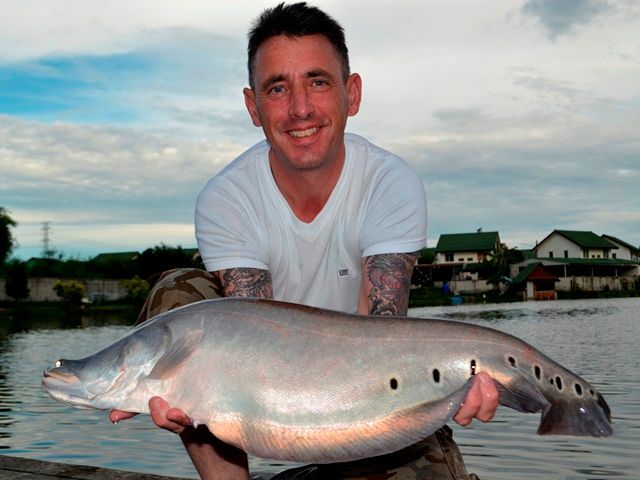 Tap of Bangkok Fishing Guide Service had another successful trip during the month with his customers catching one of our newly stocked big Siamse carp as well as a stunning albino chao phraya catfish, black shark minnow, mrigal, crystal eyed catfish mollycot and Amazon redtail. Adam James was back for his second visit during the month and we think he should change his name to Juliens James after catching five Juliens golden price carp in a single day. He also caught an awesome chao phraya catfish as well as a rare small scale mud carp, a high finned barb who's English name we don't even know, ripsaw catfish, mrigal, a stunning catla carp, pacu, several pb Siamese carp, rohu, mollycot, crystal eyed catfish, catfish shark, striped catfish, mekong catfish, yellow catfish as well as numerous both Asian and Amazon redtails. 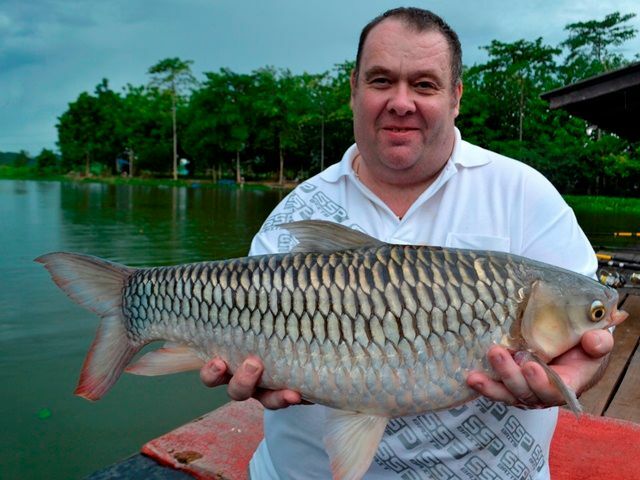 Peter Mckeever had finished his guiding stint at Gilhams and was moving around Thailand trying out some of the other fisheries. 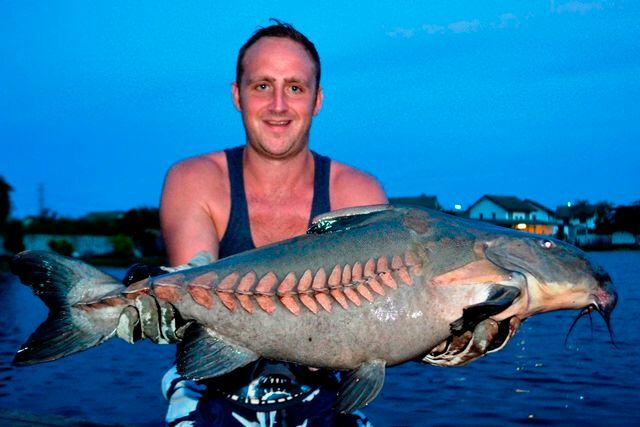 His main targets were to catch some new species particularly rohu and mrigal as well as beat his pb Siamese carp. He was off to a slow start on the first day but did manage to catch a mrigal ticking one off the list. Day two and three were much more productive landing a total of 22 fish on the third day that culminated in him catching his pb Siamese carp after a thirty minute battle of 116lb. His third goal was finally achieved as the last fish on his final day being a good sized rohu. In addition to these he caught a number of other new species to him such as catfish shark, mollycot, tambaqui and big-Y catfish. 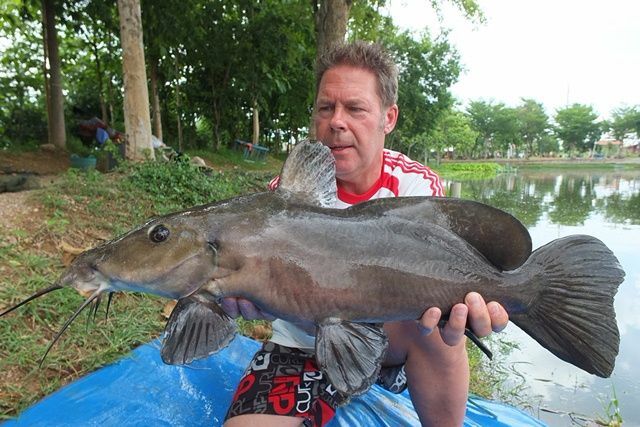 He also caught mekong catfish, clown featherback, chao phraya and a number of Thai and Amazon redtailed catfish. Mark Keates from Hong Kong had a very productive first visit to Palm Tree catching a wide variety of species that included ripsaw catfish, giraffe catfish, Siamese carp, Juliens golden price carp, striped catfish, wallago attu, crystal eyed catfish, stingray, tambaqui, chao phraya catfish, black shark minnow, rohu, mekong catfish, catfish shark, as well as both Amazon and Thai redtailed catfish. 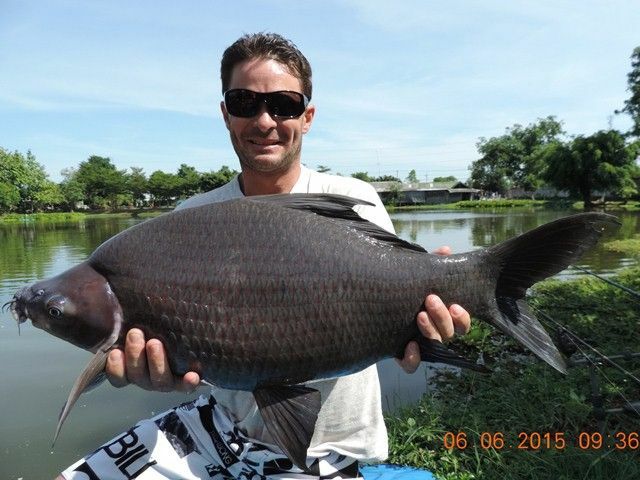 Australian angler Adam James returned only a month after his last visit and was straight into the fish with a stunning albino chao phraya and black shark minnow on his first day. On the second day he moved swim and stated that he would really like to catch a Juliens golden price carp; he certainly did better than that catching four of them in a single day. He also caught a number of other terrific fish such as rohu, yellow catfish, catfish shark, mollycot, Siamese carp and Asian and Amazon redtailed catfish. 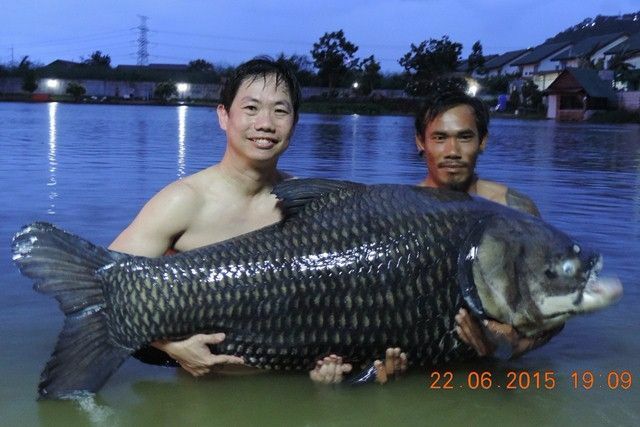 Jason Ng and his fishing friend apart from joining the ever expanding Palm Tree Lagoon 150lb Carp Club had a number of other stunning catches such as an albino chao phraya, mrigal, rohu, black ear catfish, striped catfish as well as a number of Amazon and Thai redtailed catfish. Robert Butler was back and what a session he had that included several Siamese carp over the 100lb mark as well as both Salween rita and Salween catfish. 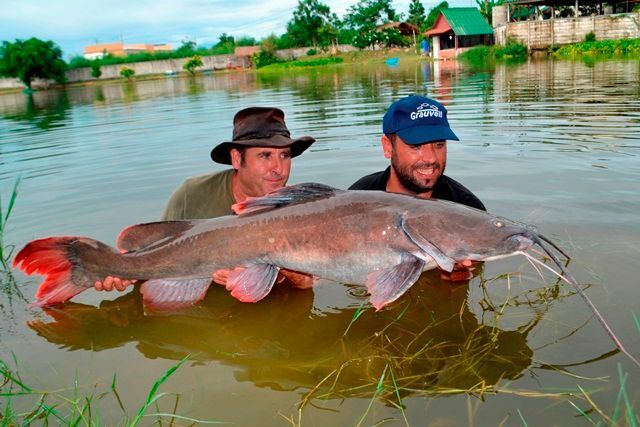 He also caught giraffe catfish, a huge African walking catfish, catla carp, chao phraya catfish, alligator gar, Juliens golden price carp, pacu, rohu as well as both Thai and Amazon redtailed catfish. Return customer Gavin Rogers from Singapore first timer Chris Wilson from Malaysia also had a great time. 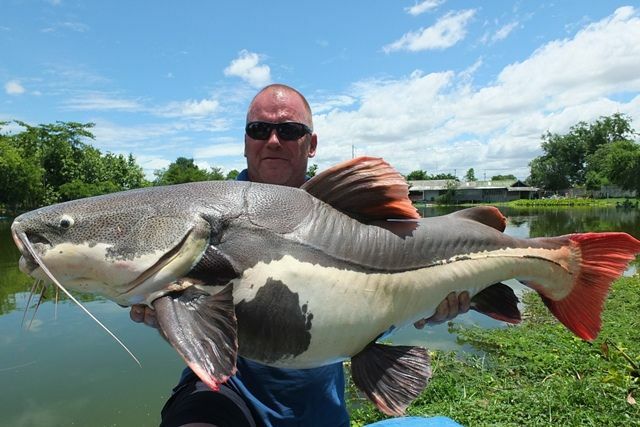 They caught a number of superb catches that included a number of wallago attu, Juliens golden price carp, stingray, leopard catfish, African walking catfish, rohu, yellow catfish, striped catfish as well as numerous Asian and Amazon redtailed catfish. John Cook was into the fish immediately landing an awesome albino Chinese bighead carp in the first couple of minutes. He then caught a number of other great fish including ripsaw catfish and striped catfish before hooking into and successfully landing after a forty minute battle a 110lb Siamese carp. He then finished off with a number of Thai and Amazon redtailed catfish. 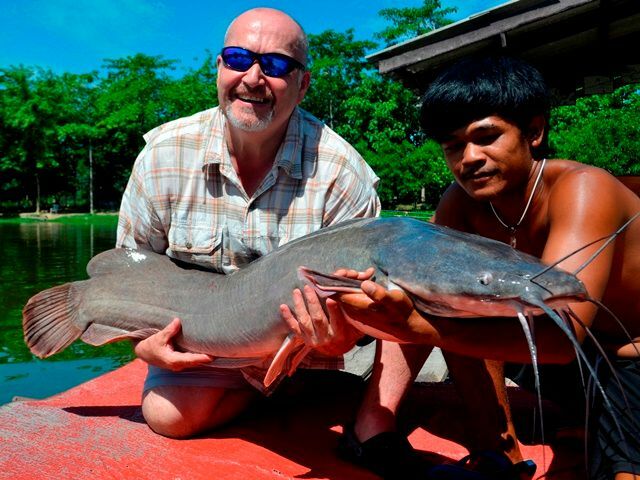 Richard Harris from London thoroughly enjoyed his first trip to Palm Tree catching a myriad of fantastic catches such as an awesome vundu catfish, Juliens golden price carp, Siamese carp, rohu, chao phraya as well as both Thai and Amazon redtailed catfish. Mark Hoye was glad to just be back fishing after his ordeals over the past year or so and made his mark with a stunning mad barb and a yellow catfish both new species for him as well as Siamese carp, mollycot and black ear catfish. 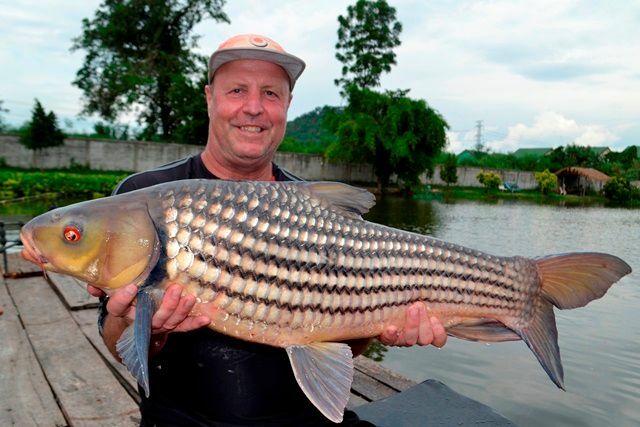 Bangkok resident Gerhard Posch returned for the first time this year catching a rarely caught golden belly barb in the margins on waggler fished bread/lum paste. 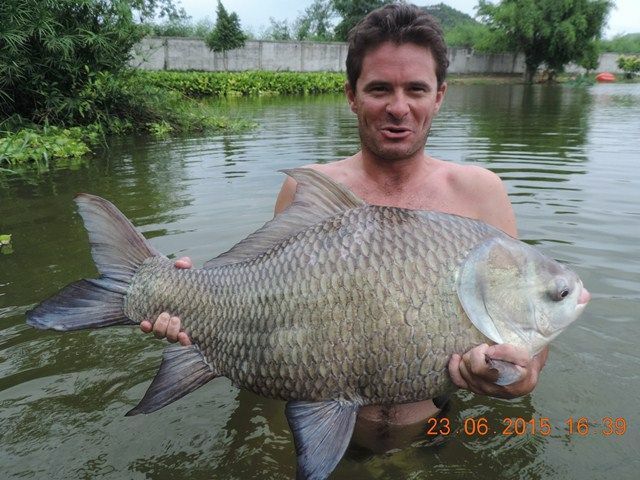 He also caught a stunning rohu, ripsaw catfish, Siamese carp and chao phraya catfish. Tap's third guiding trip for the month with return customer Cristofre Martin was another success story with some more awesome catches. These included a seldom caught marble catfish, black shark minnow, some good sized Siamese carp, rohu, a rare golden tinfoil barb, rohu, mekong catfish as well as both Asian and Amazon redtailed catfish. 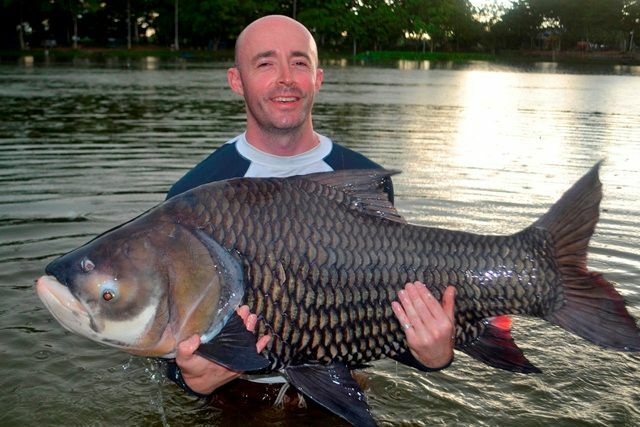 Mick Clarke came to Palm Tree with the purpose of catching himself some new species have fished around Thailand a lot in the past. Well he certainly met his goal catching a total of five new species namely Juliens golden price carp, wallago attu, black ear catfish, black shark minnow and a stunning soldier river barb. 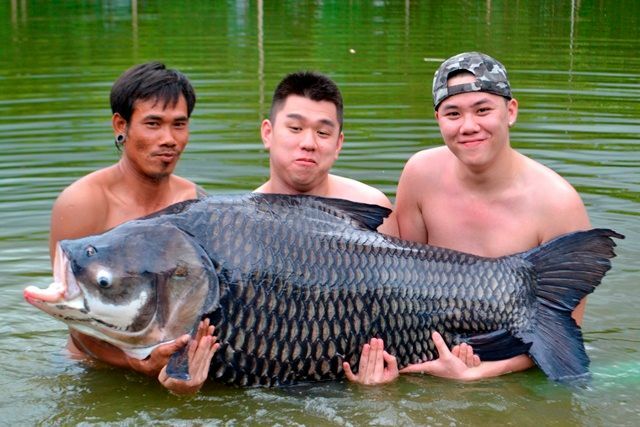 He also caught Siamese carp, striped catfish, chao phraya catfish and both Asian and Amazon redtailed catfish. 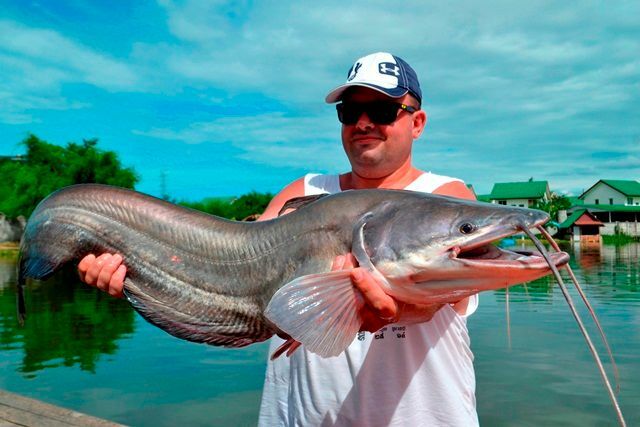 Tap of Bangkok Fishing Service Guide second trip for the month was also fruitful with his customers catching a variety of stunning fish such as some big Asian redtail catfish, mollycot, striped catfish, Siamese carp, black ear catfish and Amazon redtails. Peter Ryan, Billy Griffith and a couple of their golfing buddies were straight into some big Amazon redtails. They also went onto catch Juliens golden price carp, black shark minnow, a big mrigal, black ear catfish, rohu, Thai redtailed catfish and some good sized Siamese carp. 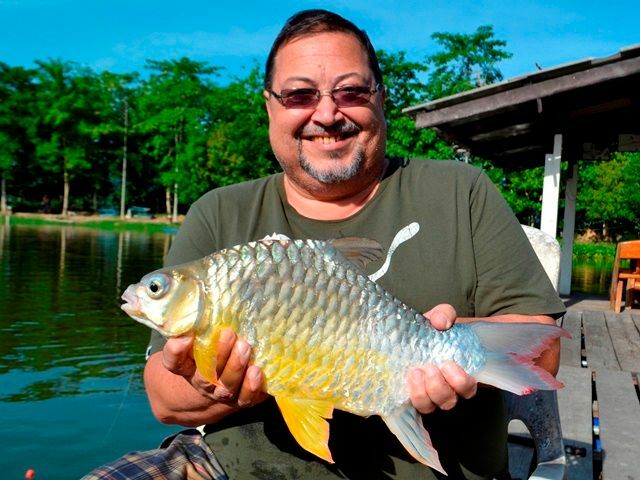 Phillip Koda returned after an eighteen month absence and had a great day catching a 116lb Siamese carp, an awesome albino pacu and a number of Asian and Amazon redtails. Kalos Anhax and his girlfriend from the Philippines made there first visit to Palm Tree and vowed to be back soon after having a cracking day catching a number of great fish that included tambaqui, Siamese carp, black shark minnow, a rare Salween catfish, rohu, striped catfish, and both Amazon and Thai redtailed catfish. 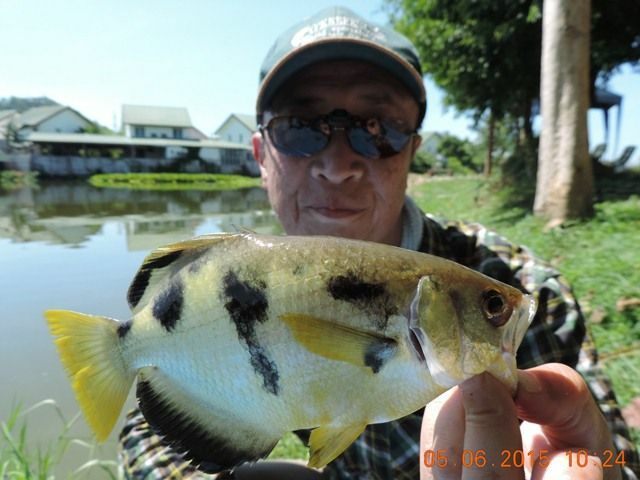 Japanese angler Atcushi Olimo had a good time catching a number of Thai and Amazon redtails including one on a fly. 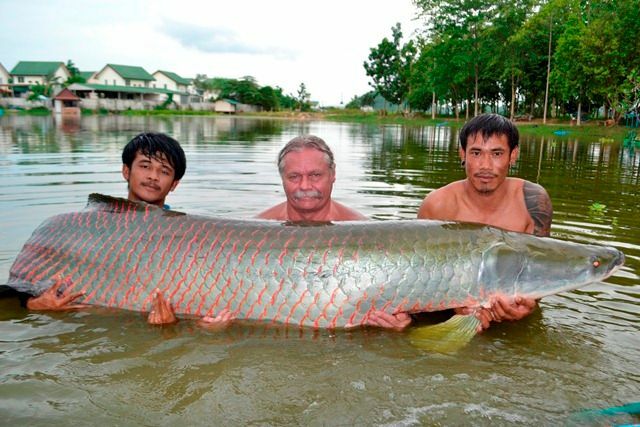 He also managed to catch a seldom caught archer fish, striped catfish and Siamese carp. He left his best to last though with the last rod about to be wound in for the day and with him already walking back to the car park the bite alarm went off resulting in a pb Siamese for him of around 80lb. 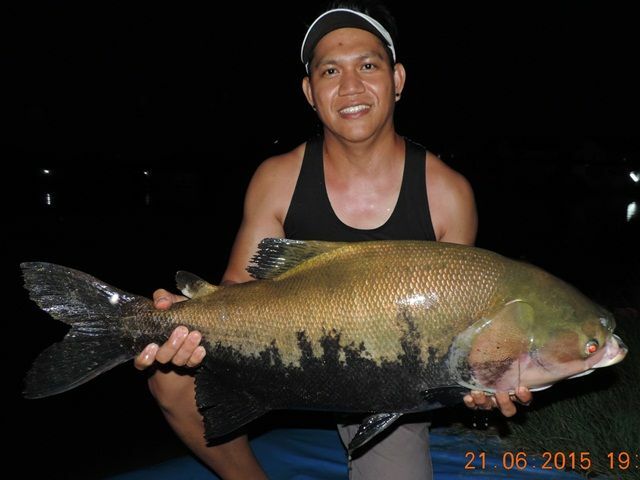 Terry Mather was back at Palm Tree and straight into a wallago attu and rohu double header. He also caught a nice clown featherback and several Amazon redtails.